That shop of horrors, Groovy Graveyard in Asbury Park, allowed me to darken its doorstep on Saturday, Oct. 17, a magical day. Halloween was in the air, and Asbury Park — the birthplace of Bud Abbott — was hoppin’. 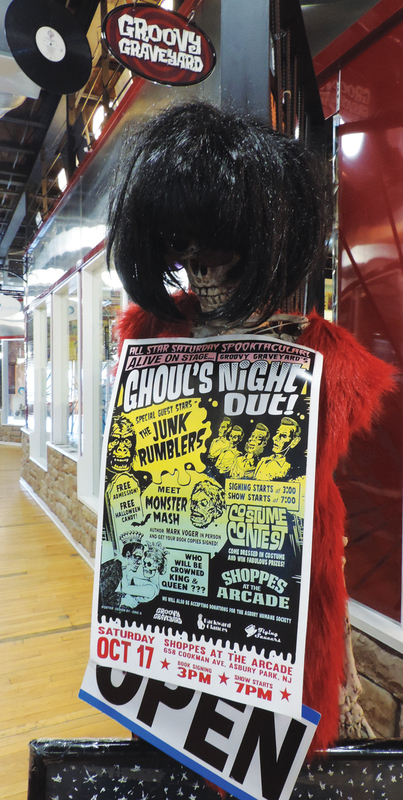 It was an all-day event that Groovy Graveyard called its “Ghouls Night Out.” (Get it? Ghouls?) I got to meet some cool people and hang out with old friends (including quite a few fellow Star-Ledger and Asbury Park Press alums). The visitor I will never forget was an 11-month-year-old tyke who was dressed as a giraffe. His mom had me sign a copy of “Monster Mash” to him. She promised to raise him as a monster fan. 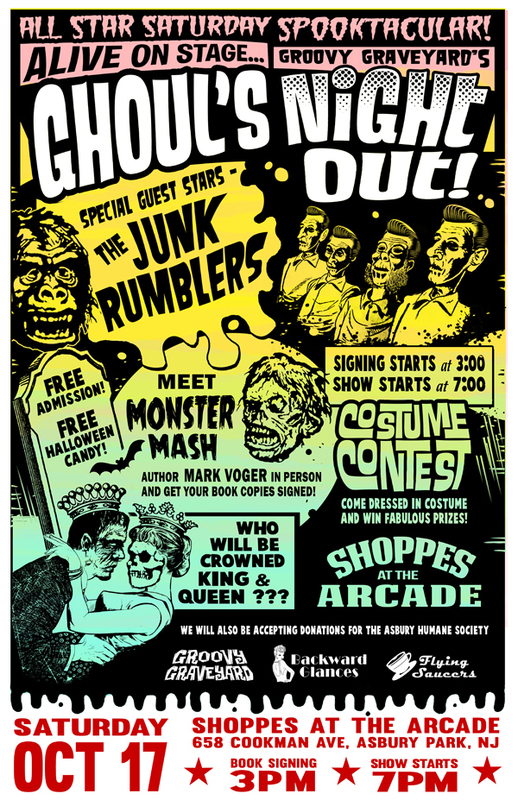 Following my signing, there was a costume contest with music by the New Jersey “rockerbilly” band Junk Rumblers. (Which is appropriate, since ’50s rock ’n’ roll was playing in the background when the Monster Craze was born.) One look at Rumblers singer/drummer Haywood Thompson’s mutton chops, and you know these guys mean business. I got to meet Haywood, who was a really cool guy. There were also folks from the Humane Society on hand, with adorable pooches in costume (and “Adopt Me” signs). 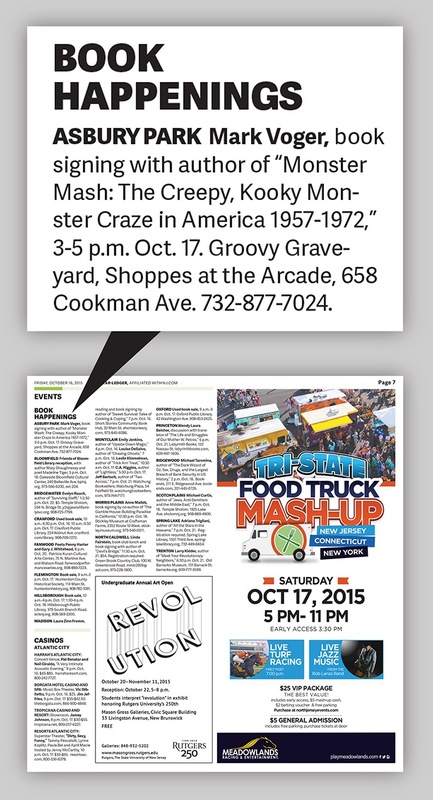 Groovy Graveyard is at 658 Cookman Ave. (within Shoppes at the Arcade). Walking into the store is like time-tripping back to the Monster Craze itself. Every scare-inch is packed with something old, creepy and cool. But it’s not all monster stuff; music aficionados go just for the vinyl. Below are some photos I took at the store prior to the event. Flanked by Frankensteins: There’s always a special place in my heart for any brick-and-mortar establishment that carries “Monster Mash.” Here it is on the shelf at Groovy Graveyard, right at home between Famous Monsters of Filmland #100 (cover boy: Boris Karloff) and FM’s 1971 Fearbook (cover boy: Christopher Lee). Old fiends: Four classic model kits by the Aurora Plastics Corp. of West Hempstead, Long Island — the Phantom of the Opera, the Wolf Man, the Mummy and Dracula (in art by the great James Bama) — adorn a shelf. 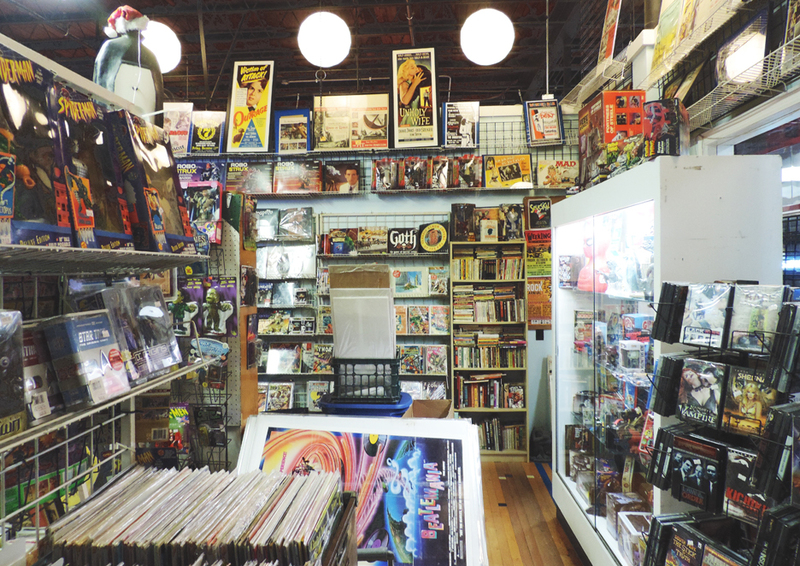 Cool stuff: Movie posters, comic books, toys, paperbacks, vinyl and DVDs beckon. 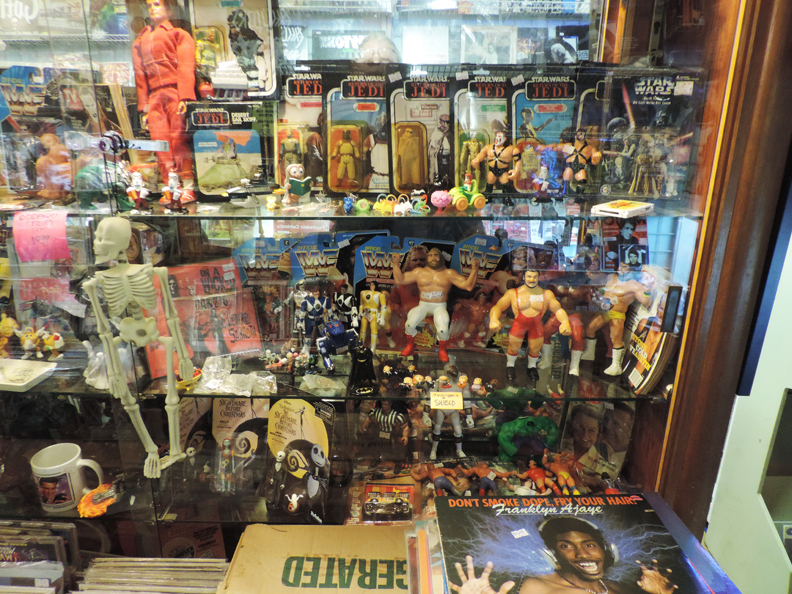 Eclectic collection: A “Six Million Dollar Man” doll; “Star Wars” Jedi action figures; rubber wrestlers; and a kick-it-old-school 33-RPM, “Don’t Smoke Dope, Fry Your Hair” by Franklyn Ajaye (1977). Silent vigil: A button-festooned bust sports 3-D glasses, left. Spidey and the Gill-Man stand watch, right. 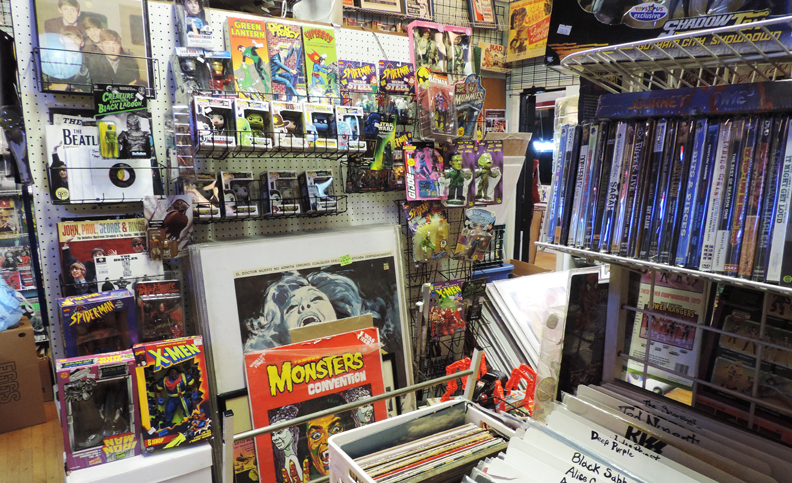 More cool stuff: Every nook and cranny is crammed with cool old stuff. Can you name the movie advertised in the poster with the screaming lady? 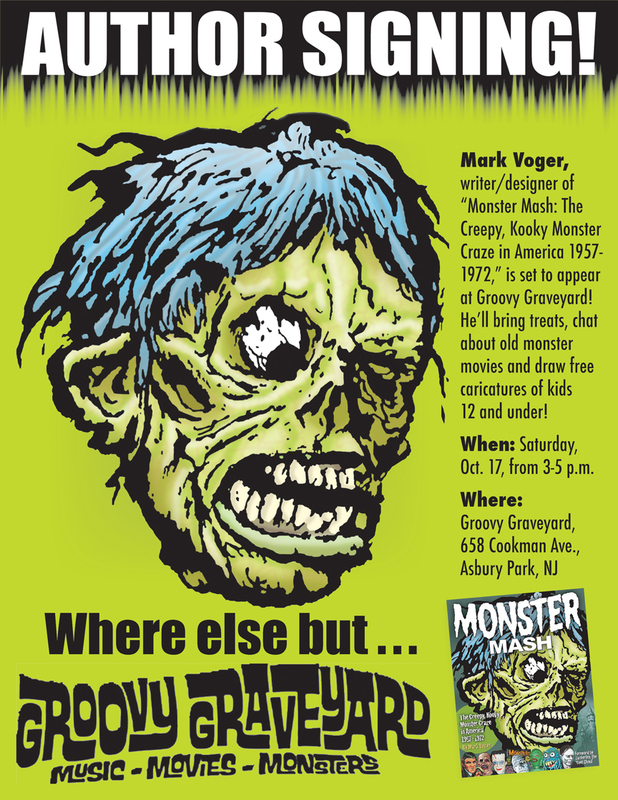 Spooks run wild: This is Groovy Graveyard’s poster for the Oct. 17 event. Eric Krause, the proprietor, told me he was trying to imitate the old “spook show” ads. I told Eric that when I was in grade school, I attended what I believe was the last gasp of those spook shows of yore. This was 1971 or ’72, a double-feature of two Mexi-movies: “Robot vs. the Aztec Mummy” and “The Vampire’s Coffin.” Between films, they showed that infamous hypnosis loop that started in the 1950s. If you stared into the center as instructed, and truly gave yourself over to it, you felt like you were in another dimension. But I digress. Green day: My flyer for the gig, above. A mod sentinel beckons at the store entrance, below.